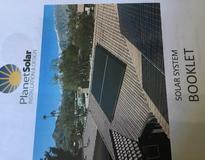 96 solar panel panel ground mount eliminates $1,300 / month electric bill. The payback will be less than 5 years with minimum utility rate increases taken into consideration. There was over 600' of trenching on this job. 300' from existing panel to new 600amp main and another 300' to the array. Palomar Solar always up sizes the wire above code. On jobs with this much trenching that needs to be considered by the homeowner otherwise you could have a drop in voltage and production. We do not suggest skimping on this as with all parts of your project especially large ground mounts you get what you pay for and unfortunately to many companies skimp at the uneducated homeowners future expense. We always suggest installing a water line so you have access to a hose to clean your panels as often as needed. This will vary depending on where the system was installed and how much dust collects. The financial investment made 1000% sense especially given our current shaky investment options. I wanted something tangible. Find the right installer. We believe solar can be the best investment or worse depending on who you buy it from. Do not take a salesman's word. Do you homework. Go look at jobs and talk to current customers who've had their system longer than a year and see if their systems are producing what was sold. 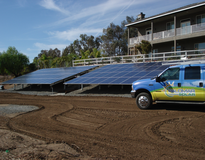 Palomar Solar has 100% customer satisfaction. I interviewed 8 companies before choosing them. I own four Hardware stores and have lot's of experience dealing with contractors over the years. Palomar Solar ranks in my top five as there were no issues with this complex installation and best of all no costly change orders from being under bid!